This page is a list of common (and uncommon) accessories you can get for guitar. It is not a buying guide, but it will give you an idea of what to expect in your local guitar shop. While they are not all necessary for playing guitar, some of them are extremely useful and are a good investment. Picks are probably the most frequently bought guitar accessory. There are several reasons, but mostly it is because there are so many types of picks, and picks are so easily lost. When you go to the guitar store, you are overwhelmed by the agony of choice, and this is especially true for the beginner. Picks are probably as old as guitars themselves, although most modern picks are made out of plastic, or sometimes metal. Apart from shape and size of the picks, its strength and the material used to make it are important, because these affect the "feel" of playing with the pick. Up until about the 70's, most picks were made out of horn or turtle shell. Turtle shell was generally better, because it allowed some flexibility when hitting the strings. However, over time this was devastating the turtle population, and now most picks are made of nylon or plastic. Generally nylon picks have the same properties of the turtle shells, and plastic picks are thicker and denser. 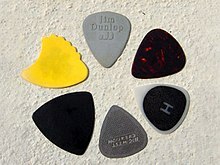 However, the general disadvantage of plastic picks is that they wear out quickly, especially if you play fast and hard. Since the guitar industry constantly experiments with new materials, you might walk into the guitar shop and find something completely exotic. For example, you can buy picks made from hard leather, which are outstanding for classical guitars because of the soft feeling. Selecting the correct pick for you depends above all on what style of guitar you want to play. Lead or rhythm? Will you be slowly strumming chords, or chugging away on distorted power chords? Each style is most easily accomplished with a particular type of pick. Generally speaking, how hard a pick you use depends on how hard your strings are. Heavier strings will require thicker picks, and vice versa. The shape of the pick determines how much operating area you have to use. For example, rhythm guitarists usually use blunter, larger picks, and lead guitarists use pointier picks so they can more precisely hit individual strings. If you use hard picks, you will get a hard sound out of the strings, especially with metal picks. Generally the thicker the pick the less "give" there will be when you strum a chord. However, because no two companies manufacture picks with the same material, Company X's 0.76 mm pick will feel different than Company Y's 0.76 mm. Above all, remember that you should always select a pick based on your ability to handle it. You can only play well with a pick if it fits well in your hand. Picks for the guitar typically range in thickness from the ultra thin 0.38 mm to the really thick 1.14 mm, although bass picks can be thicker. A mid range pick would be something about 0.76 mm thick. Beginners will usually prefer softer picks until they can learn to hold them securely. Aside from the thickness and mass of the pick, there also exist different pick types. There's the finger pick, which fits over your fingers with a ring (thumb-pick is special because it's angled), and even your normal picks may have different shapes, such as shark-fin (better at chord), sharppoint, etc. Each type of guitar uses its own type of strings. Strings are specifically designed for a type of guitar to give it a particular sort of sound. The differences between string types affect the guitar's tone, and it is not recommended to use a set of strings not made for your guitar. Not only would the result not sound good, but attempting to string a guitar with the wrong kind of strings would be difficult, frustrating, and might damage your instrument. Three of the best and most popular brands of guitar strings for both acoustic and electric guitar are currently Ernie Ball, D'Addario, and Elixir. Ernie Balls and D'Addarios are much cheaper than Elixirs, but Elixirs will keep their bright tone for months (which is why they are higher-priced). But Elixirs can break as easily as any other strings, so they are perhaps best left to people who have been playing a long time and rarely snap strings. The difference between the other two brands is a matter of taste; try them both. A classical guitar has three bronze wound strings and three strings made out of nylon, which are the higher pitched. A set of strings for a steel string acoustic has four bronze wound strings and two silvered steel strings, the steel ones being the thinnest and highest pitched. A set of electric guitar strings are similar to an acoustic guitar's, except the strings are made of nickel instead of bronze and steel. Often there are three wound strings and three nickel strings, but you can also get four wound and two nickel. The two most common gauges for the high E string in electric guitars are .009 inches and .010 inches (these measurements appear to be used often even in countries using the metric system). Often a whole set of strings is referred to by the gauge of the high E string, e.g., "nines" or "tens" for .009 and .010 gauges respectively. The beginning guitarist is recommended to start with .009s; many professionals also use this gauge, so many guitarists never "outgrow" it. However, if you wish to try something new, you may want to try out .010 gauge strings once you get used to the lighter .009s. This is only recommended after you have been playing for a while, as your calluses need time to form, and your fingers need to get stronger. This procedure also applies to strings above the .010 range. There are also .011, .012, and .013 gauge strings readily available from all of the manufacturers mentioned above. The benefit of higher gauge strings is tone. If you are planning on playing metal guitar, or any other genre that uses a lot of distortion or overdrive, you probably will not notice a difference in the sound. Alternatively, if you are playing blues or rock, a higher gauge string will give you a heavier, "dirtier" sound, very preferable to these types of music. Stevie Ray Vaughan is notorious for using very heavy gauge strings (some sources claim .014 gauge), contributing a lot to his signature tone. Electronic tuners are a quick, accurate, and precise method of tuning. A tuner can be used in two ways, either through a built in microphone which detects sound, or by directly jacking in an electric guitar. When a note is played, the tuner determines the note you are playing, and then represents visually how sharp or flat the note is. Most models use a combination of lights and a display screen to indicate the tone of the note. Electronic tuners can be easily drowned out by background noise when you do not jack directly into them. Because of this, they are best used in a quiet environment. A tuning fork is a piece of U-shapes piece of metal that, when struck, emits a particular tone. Tuning forks are good because, unless bent, they will always emit the same note. The most common tuning forks resonate at either an A, which at the frequency of 440 hertz, or C. Using a tuning fork is generally recommended for more advanced players. You can buy a tuning fork that sounds the note E. Many guitarists prefer this due to the fact that the guitar's lowest and highest strings are both E.
To use a tuning fork, gently strike it against the heel of your hand and it will vibrate. Then, set the base of the fork against the body of the guitar if it is acoustic. The sound of the fork will be amplified through the guitar, and you can use it to tune your strings. If you have an electric guitar, you must hold the tuning fork to your ear, and then tune your strings. It is important not to strike the fork against a hard surface, as this may bend the fork out of tune. If you are using an A tuning fork, then you should tune first to the harmonic on A string. However, you can also use the 5th fret on the low E string, the 7th fret of the D string, the 2nd fret on the G string, or the 5th fret on the high E string. All of these frets produce an A, although some are in a higher octave. A pitchpipe is much like a tuning fork, in that it only plays one note and that note is used for tuning. To use a pitchpipe, you blow through the end like a whistle. Traditional breath powered pitchpipes are notoriously unreliable, because temperature changes can affect the note that they play. You can also purchase electronic pitchpipes, which emit notes through a speaker. Some electronic tuners also have this feature. Cables are used to connect two sound devices together, like a guitar and an amplifier. There are many different types, each for a different purpose, and it is good for a guitarist to familiarize themselves with some common types. A string crank is essentially a handle with a rotating cap, designed to fit over top of a tuning peg. It makes unwinding strings much quicker, and some also have a slot to help remove the pegs near the bridge that hold the strings in the body. A slide or bottleneck is a ceramic, glass or metal cylinder, usually worn on the fingers rather than held in the hand. The term slide is in reference to the sliding motion of the slide against the strings, while bottleneck refers to the original material of choice for such slides, which were the necks of glass bottles. Instead of altering the pitch of the strings in the normal manner (by pressing the string against frets), a slide is placed upon the string to vary its vibrating length and pitch. This slide can then be moved along the string without lifting, creating continuous transitions in pitch. A capo (short for capotasto, which is Italian for "head of fretboard") is a device used for shortening the strings, and hence raising the pitch of the guitar. Capos are used to change the key and pitch of a guitar sound without having to adjust the strings with the tuning keys. It was invented by the Flamenco guitarist Jose Patino Gonzalez. Flamenco and folk guitar make extensive use of the capo, while it is used very rarely, if at all, in styles like classical guitar and jazz. Capos are useful and good to have, but sometimes they prevent a player from properly learning how to play barre chords. Capos and barre chords both have their uses, and there certainly is no reason you cannot learn to use both. There are several different styles of capo available, but the basic method is the same; a rubber covered bar pressed down on the strings, and it is fastened on the neck with a strip of elastic or some sort of clamping mechanism. Some special capos can fret individual strings at individual frets, enabling a player to create an open tuning, or have two fretting bars, allowing you to quickly change from one tuning to another without having to move the capo itself. A simple version can be made with a pencil and a rubber band. Lay the pencil (preferably one with flat surfaces) across the strings at the desired fret, and holding it in place by wrapping the rubber band around both ends and underneath the fretboard. Because of the different techniques and chord voicings available in different keys, chords played with a capo may sound different. For example, placing the capo at the second fret and strumming a C major chord-shape sounds different than strumming an open D major chord. Although both of these produce the same chords, they each have a different tone and texture. Capos also change the timbre of the strings as the scale length is shortened, making the guitar sound more like a mandolin. Capos give you a greater varieties of sounds you can achieve on the guitar, using open chords and alternate tunings. A capo is almost essential for older twelve string guitars because manufacturers would strongly recommend that the instrument not be tuned above a tone below standard guitar tuning to reduce stress on the neck. Modern 12-strings can be tuned up to pitch with ultra light gauge strings, but many players still prefer to tune a tone lower and use a capo to play in tune with six-string or bass guitars. A metronome is a device that produces a regulated audible beat, and/or a visual pulse, used to establish a steady tempo. Tempos are measured in beats-per-minute (BPM), and a metronome is invaluable for setting a proper pace, especially when practicing. Although it is possible to buy metronomes with moving parts, most modern ones are electronic. Sophisticated metronomes can produce two or more distinct sounds. A regular "tick" sound indicates the beat within each measure, and another, distinct sound (often of a different timbre, higher pitch or greater volume) indicates the beginning of each measure. A tempo control adjusts the amount of time separating each beat (typically measured in beats per minute), while another, discrete, control adjusts the meter of the rhythm and thus the number of beats in each measure. This number is an integer often ranging from one to six, though some metronomes go up to nine or higher. Some devices also have options for irregular time signatures such as 5/4 or 7/8, in which other distinct sounds indicate the beginning of each subgroup of beats within a measure. When reading music, it's best to use a music stand, as it can be set up at a proper angle. Furthermore, with a sturdy collapsible stand, one can have a reliable platform anywhere.